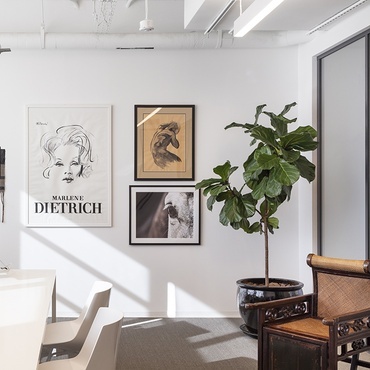 "We brought the African jungle to the concrete jungle," Ghislaine Viñas says about the interiors for Barrows, a New York–based marketing agency. 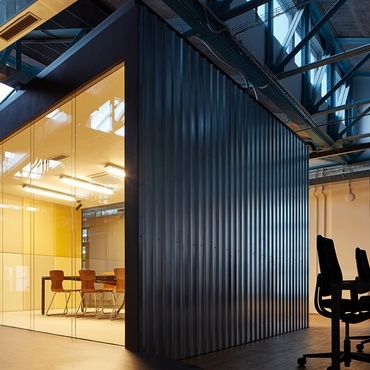 Furnishings inside are mostly green, from Arik Levy's high-backed sofa to the rug on the polished concrete floor. 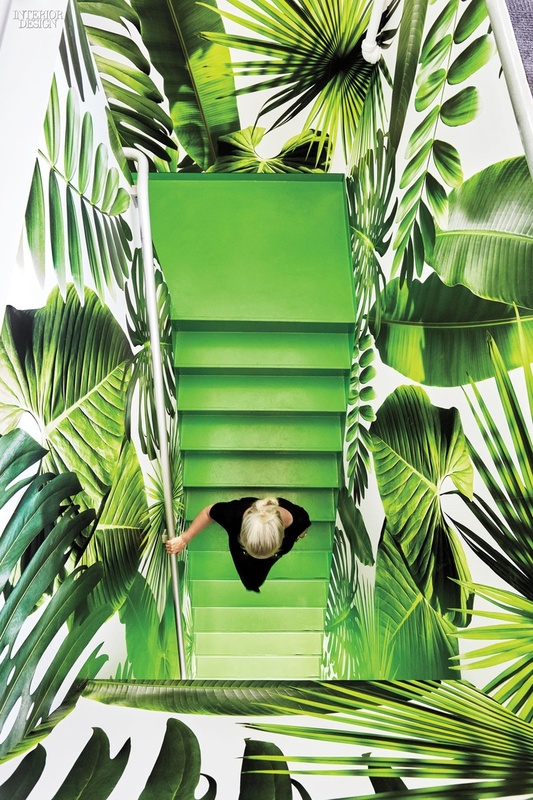 Viñas worked with her husband, Jaime, and Jon Sherman to design Flavor Paper wallpaper for the stairwell, which combines mammoth green leaves from plants indigenous to South Africa. 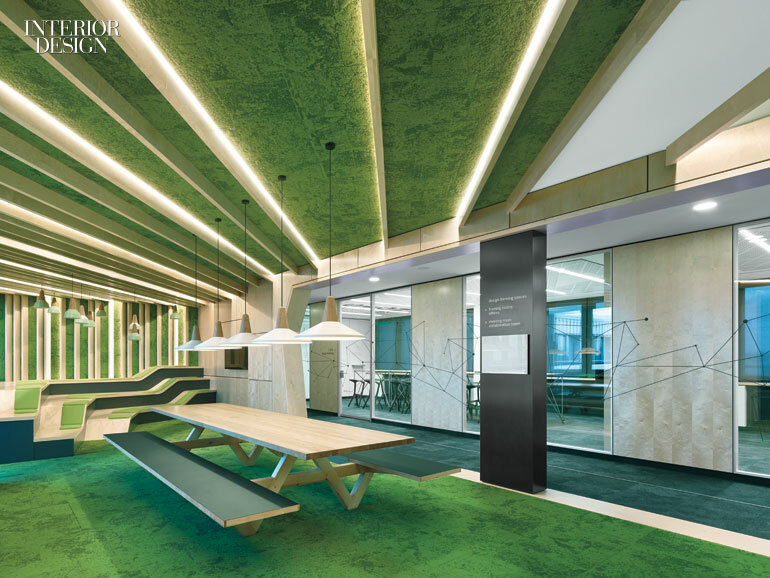 Mike Herud and Oliver Kettenhofen of Scope Architekten envision a vibrant city park as the perfect work environment, which they channeled for an education center at SAP headquarters in Walldorf, Germany. 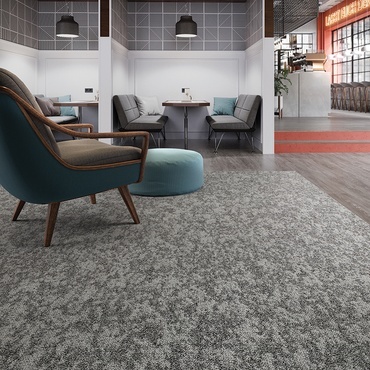 Soft "grass," actually green carpet, covers the floor, the ceiling, and a wall descending into stadium-style seating. 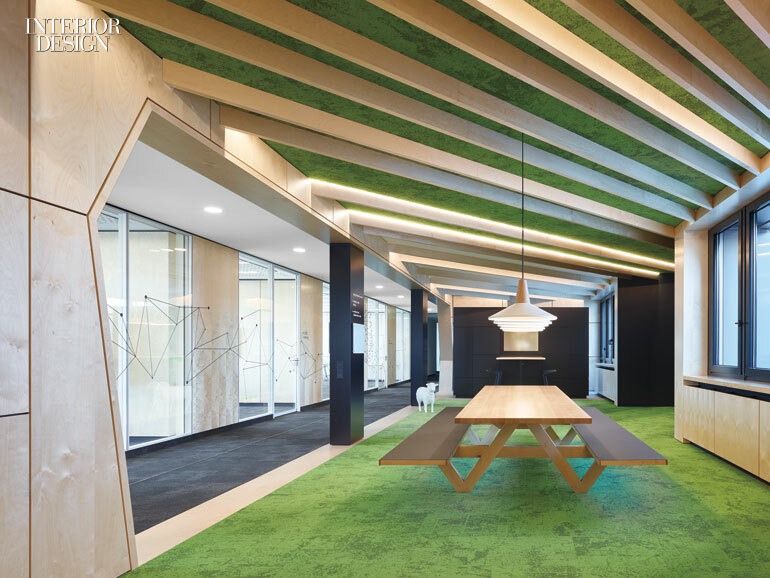 Instead of a corporate conference table, there's a picnic-style table with benches. 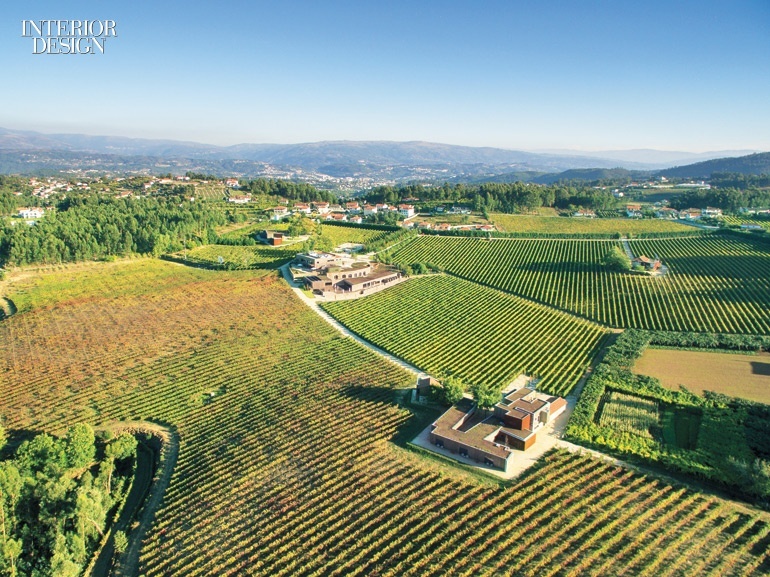 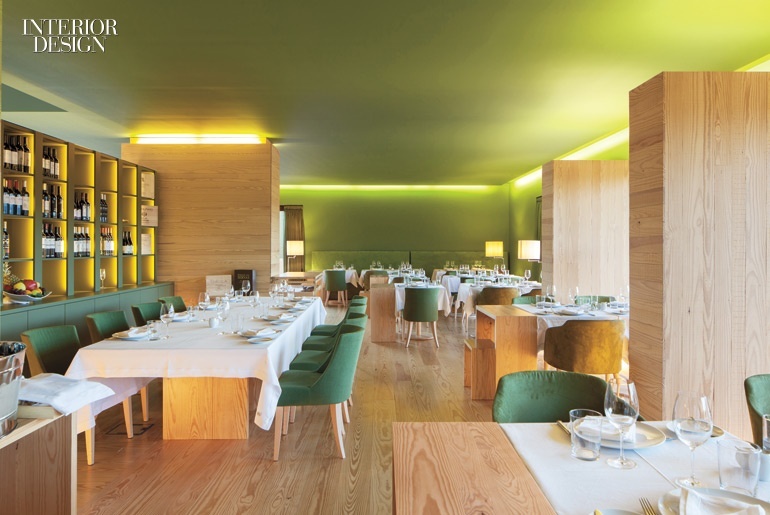 Against a backdrop of predominantly clear-finished pine, colors inside the Monverde Wine Experience Hotel by FCC Architecture and Paulo Lobo Interior Design are earthy, dappled with the vineyard's springtime green and autumnal russet, Pantone-matched to wine leaves. 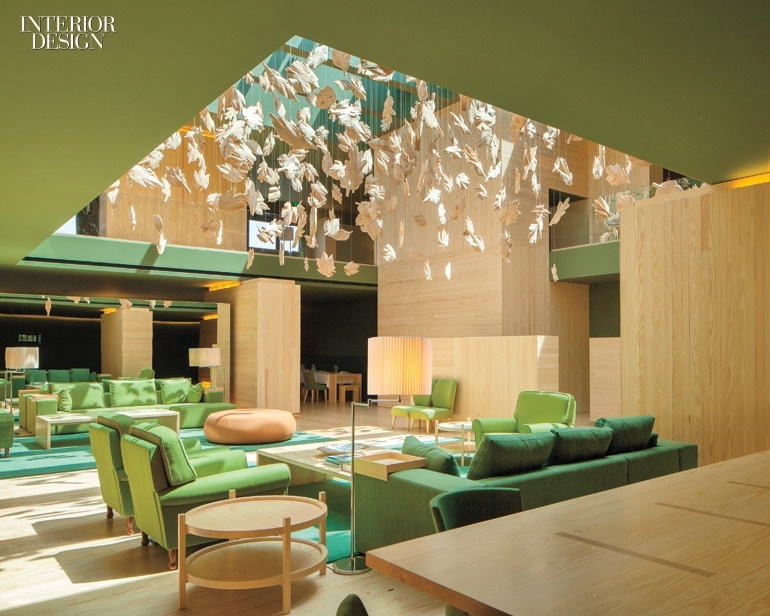 A kinetic installation that dangles above the lobby takes the metaphor one step further—366 carved cedar leaf shapes, each bearing a smiling face, nods to the workers of Amarante, Portugal, who make the experience possible. 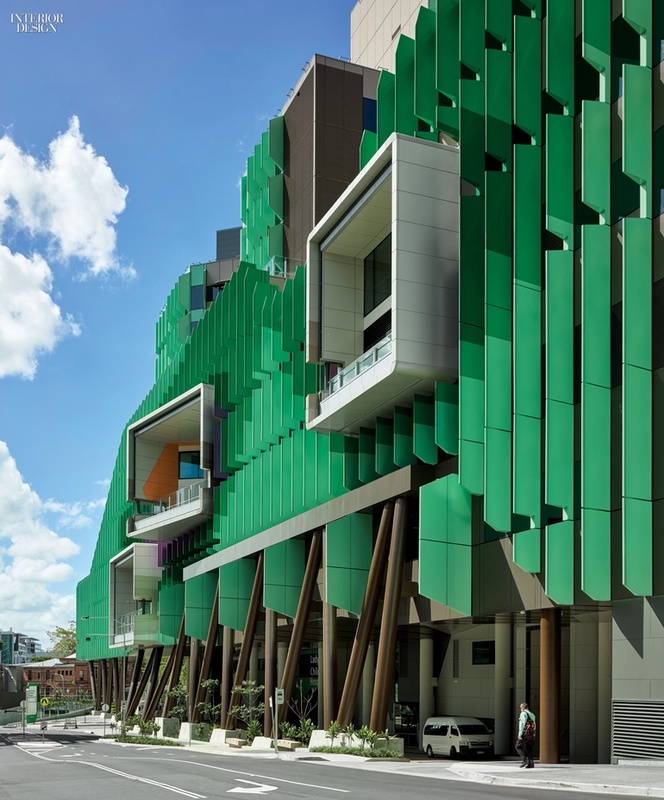 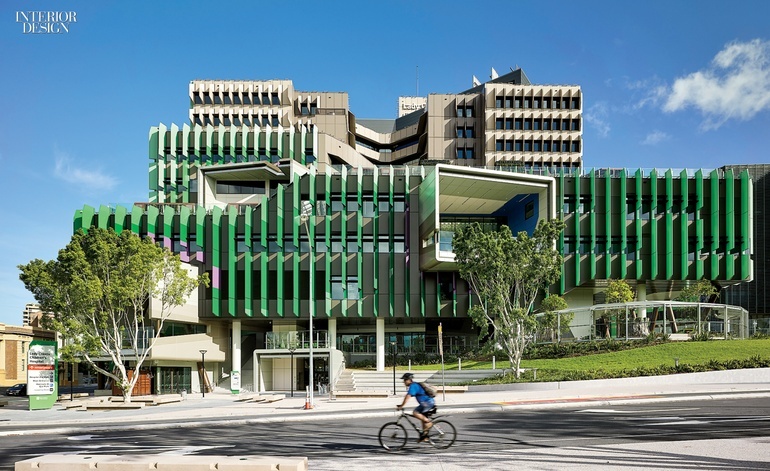 Beyond the facade's postmodern-looking assemblage of bright green-painted aluminum fins and jutting steel frames, the Lady Cilento Children's Hospital in Brisbane, Australia, by Conrad Gargett and Lyons Architecture takes "green space" literally. 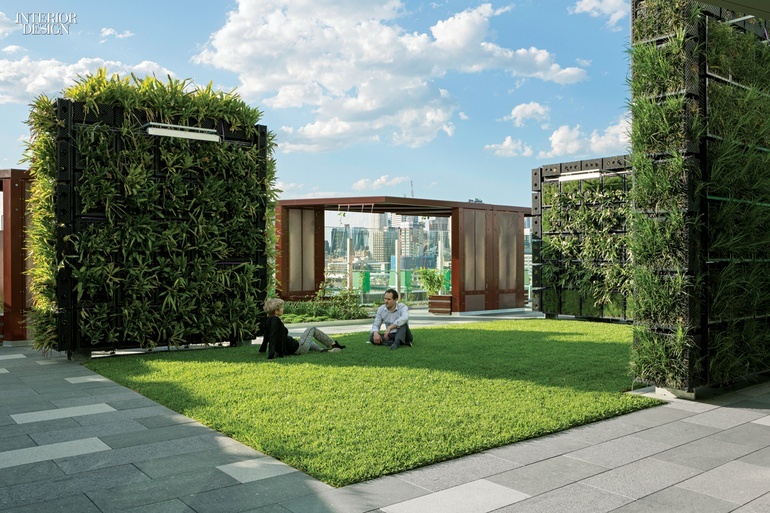 Patients can shoot hoops or scale a climbing wall during the day, then settle on a grassy knoll to watch a movie at night. 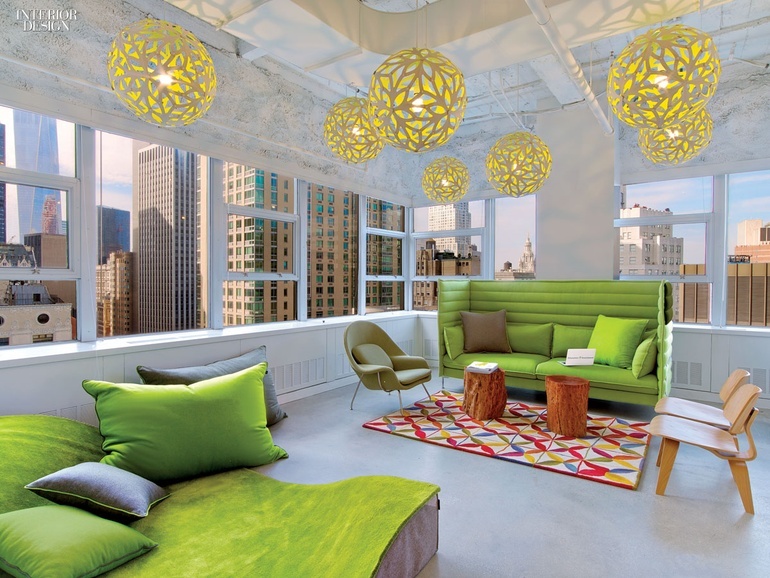 Taking inspiration from the organization's chalk-scribbled bright green apple logo, Kati Curtis Design decided to make the color green the element that threads their entire New York City office together. 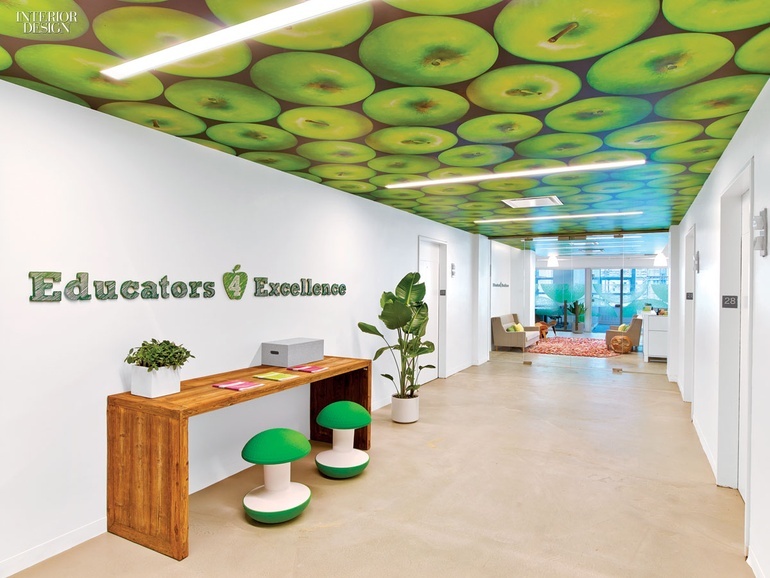 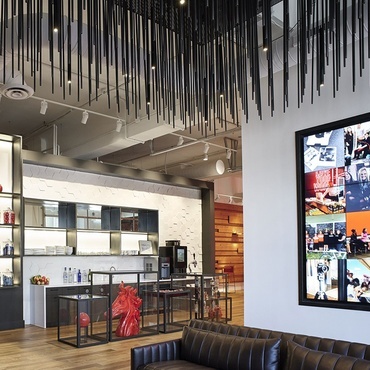 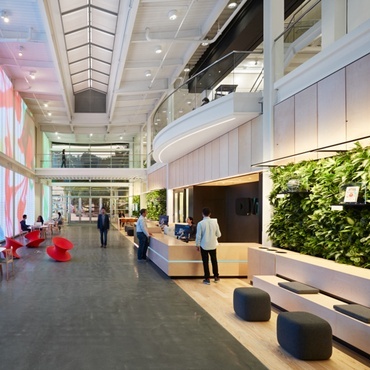 She sought out a mixture of different shades, from the forest green of Humanscale's Ballo ottomans to the large-scale graphics of Granny Smith apples that adorn the elevator lobby and reception area. 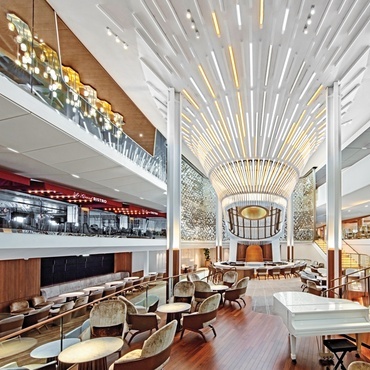 When designing the Nanchang Insun International Cinema, One Plus Partnership took their inspiration from books. 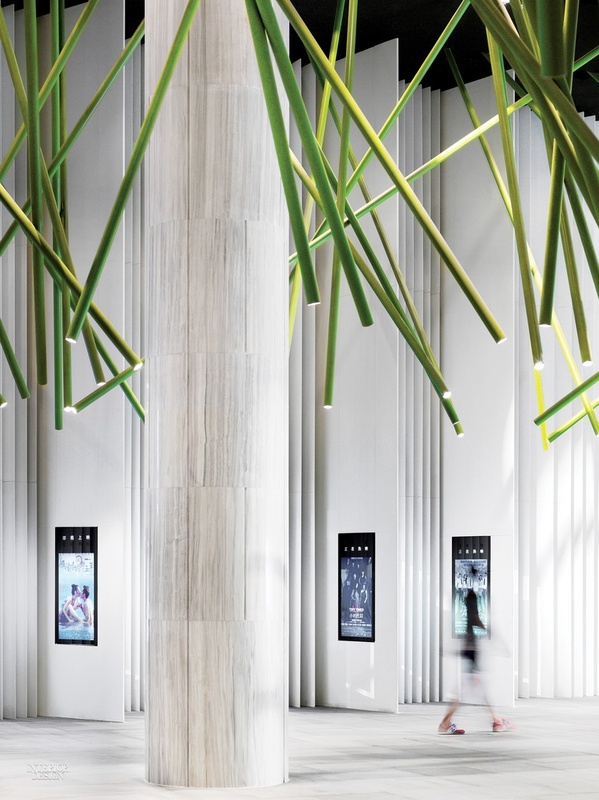 Since paper is made from trees, the Chinese firm designed long, skinny, tubular light fixtures that angle down from the ceiling like branches. 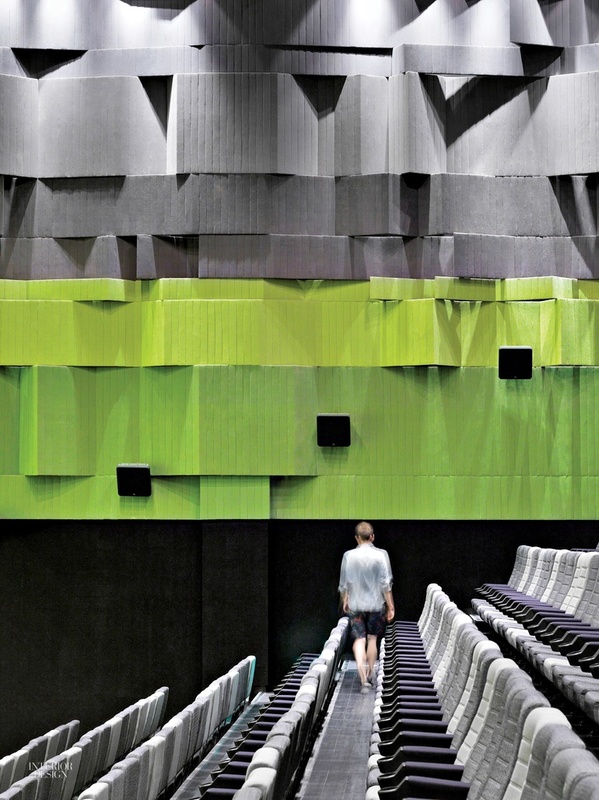 The motif continues inside the theaters, which feature accent walls fashioned from green acoustic panels. 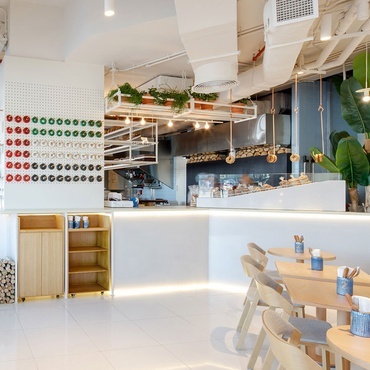 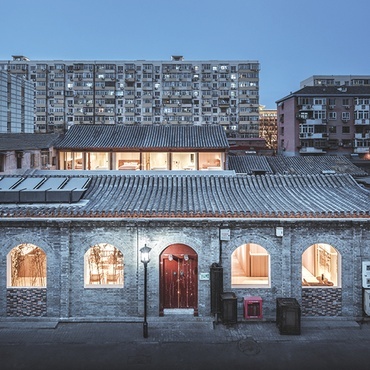 Half of Id Inc.'s Sumiyoshido Kampo Lounge—which sounds like a bar but is actually an apothecary and spa—is devoted to the apothecary, where the fresh mint green of the storage-display system targets a youthful aesthetic. 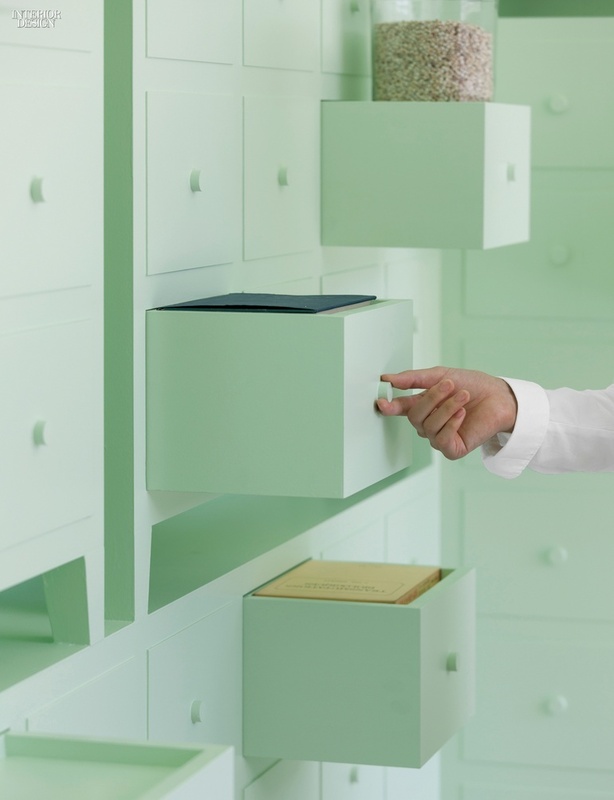 Though it looks like there are hundreds of drawers, a nod to traditional apothecaries, only 25 open.